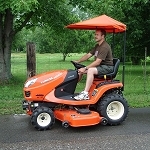 Want to keep the hot sun from beating down on you without enclosing yourself in a cab on your Kubota vehicle? Original Tractor Cab has a great selection of sun shades that install quickly and easily onto a variety of Kubota mowers, tractors, and much more. Our selection includes universal sun shades for zero turn mowers and tractors with ROPS bars and other machines with ROPS bars at specific dimensions, as well as sun shades for Kubota ZD, ZG, GF, and more including the Kubota GR2000, GR2100, GR2010, GR2110, 2020, and 2120 series. All sun shades come with instructions and install with minimal fuss. Need help? We welcome you to call our toll-free number at 800-247-5305 and we'll be happy to assist you.